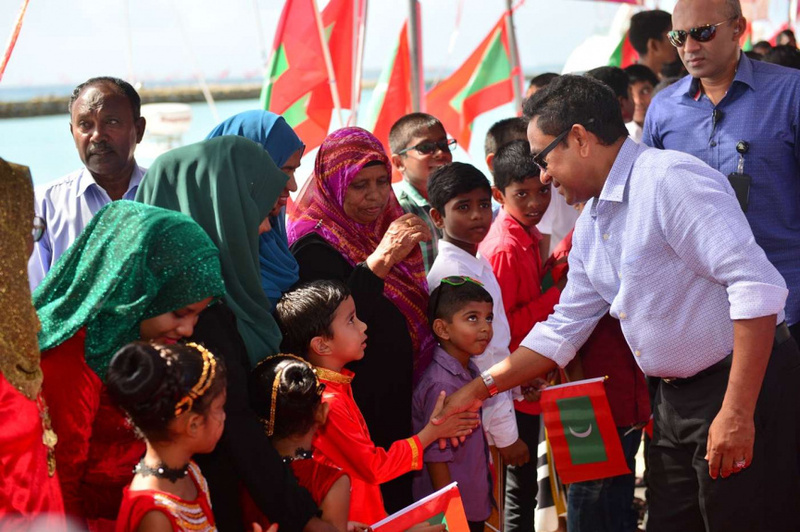 President Abdulla Yameen Abdul Gayoom has departed on a tour of several islands in G. A. Atoll and G. Dh. Atoll. Yameen left on the tour this Tuesday morning. President’s Office reports Yameen is scheduled to visit G. Dh. Madaveli, G. Dh. Faresmaathodaa and G. Dh. Gadhdhoo and participate in functions to celebrate completion of coastal protection projects on the islands and inaugurate harbors on the islands. He will also inaugurate sanitation services and housing units in Gadhdhoo. Yameen will then travel to G. A. Kondey and inaugurate the island’s harbor, travel to G. A. Kolamaafushi and inaugurate sanitation services and water services on the island, travel to G. A. Vilingili and mark completion of the road development project on the island and inaugurate the housing units on the island, and travel to G. A. Kooddoo and inaugurate the Fishermen’s Marina on the island. The tour will last three days.